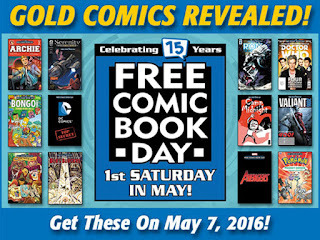 I Missed Last Year's Free Comic Book Day! That will not happen again! as we'll have our hands full with some free comics! Where can you go to get your free comics? 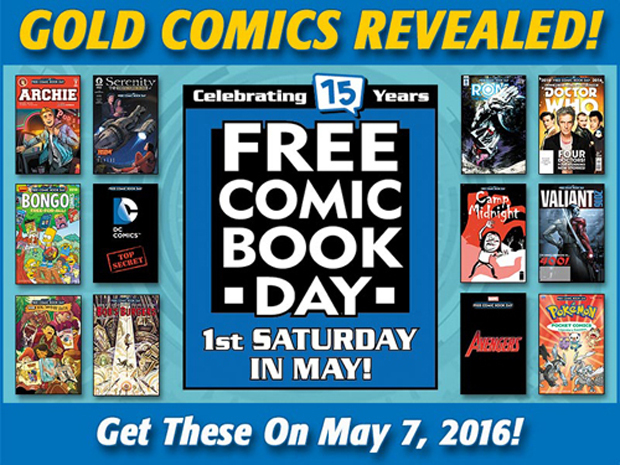 a ton of In-Store specials and $1 Comics at the ready! DC SuperHero Girls for young girls that enjoy the hour special a month or two ago! Doctor Who Fans will enjoy a book with 4 Doctors in it! Did you just see Civil War? Grab the First Issue in Civil War II! Can't Wait for the Suicide Squad in August? DON'T! Grab a Free Comic Today! There are so Many different books it'll be a hard choice to make! From The Tick to The Phantom, SpongeBob to Simpsons, and Archie to Street Fighter! Free Comics Don't Come around like this Every Day! So What Comics are you Picking up Today? I'll be posting my haul on Instagram Later Today! Don't know where the nearest Comic Shop is at? Find a Participating Store ----> HERE! !